“Listen to rough jazz” is a something Charlie Haden said in his last concert in his home town of Springfield Missouri. The play on words is that rough jazz is the opposite of smooth jazz, the ubiquitous, insipid jazz format of unchallenging, uncreative, and unobjectionable background music. Rough jazz, roughly, means, “hard bop and modern jazz, or music that led to it (or came from it),” or, alternatively, “music that swings, is improvised, uses blue notes and call and response.” It just means “real jazz.” Charlie Haden is the rightmost in this great photograph. Why do I call it great? Because all I see is the love of creative music. Charlie grew up in the Ozarks town of Springfield but somehow all he wanted to do was play jazz. His dad took him to a concert of a jazz dance band that came through town and Charlie got to meet them in their hotel room. He said remembered that it smelled funny. One of them said to Charlie, “Look at us. We got nothing but the music. Do you want to end up like us?” “Yeaaaaaah,” said Charlie. Within the year after Charlie Haden left Springfield, he was playing with Ornette Coleman on one of the most famous jazz albums of all time, The Shape of Jazz to Come. Next to Charlie in the photo is Don Cherry, who also played in Ornette’s Quartet and about whom the trumpeter and composer Baikida Carroll wrote a song, “I do not know the world without Don Cherry,” one of the most beautiful eulogies I know. 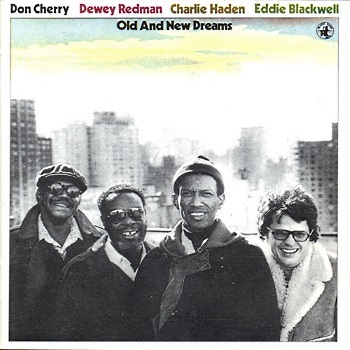 The next guy is Dewey Redman, one of the greatest jazz saxophonists ever. There is some kind of line there, I guess, between a genius like Ornette and a great sax player like Dewey; maybe sometimes you would want one, sometimes the other. And finally, if drummer Ed Blackwell is is on an album then that album is worth hearing; the last album by Old and New Dreams is dedicated to Ed Blackwell. So, if you want to learn to hear Rough Jazz, then start with Old and New Dreams. Charlie Haden died last year and so they are all gone now, all four of them. This music is comparable to theater in ancient Athens (Aeschylus, Sophocles, Euripides, Aristophanes) , art during the Italian Renaissance (Leonardo, Michelangelo, Raphael, Titian), Classical Music (Haydn, Mozart, Beethoven, Brahms, Stravinsky), French painting (Renoir, Monet, Van Gogh, Picasso, Matisse) Compare this list please: Louis Armstrong, Bessie Smith, Duke Ellington, Charlie Parker, Thelonious Monk, Charles Mingus, Ella Fitzgerald, John Coltrane, Ornette Coleman, Miles Davis. These geniuses were all alive during my lifetime. Wow. Damn. By “genius,” I don’t just mean a great player, I mean someone who pushed the edges of the tradition into new fertile territory, which then became a part of the tradition. The list of great players would be quite a bit longer of course, and, because jazz is improvised, every one of those great players is also a composer, every time they play. As improvisers, jazz musicians don’t play the predictable rhythm or line; therefore, if predictability drives you crazy, as it does me, then rough jazz will keep you sane.